Variance is a term commonly thrown around in poker. While poker is luck based in the short term it is nearly all skill in the long run. The correct play will frequently have a worse result than the incorrect play; good players will frequently lose to bad players. This is why learning to play well is so difficult. Understanding and calculating variance and how to apply the variance number to your poker game will help you become a better poker player. What is variance in relation to poker? How does a player quantify variance? What is the meaning of the poker variance number? In addition, we’ll look at how luck influences results. What is Variance in Poker? Simply put variance measures uncertainty. A high variance play has a lot of uncertainty. It has potential to turn out really well or really poorly. If the outcome of a play is relatively certain it is a low variance play. Folding has a variance of 0. This is because you know what the outcome of folding will be. There are a few quiz type questions in the article, the answers to them are at the end. Try to do them without looking at the answer. Before we get started, it’s important to understand a few terms. The first is a distribution. Distribution: A distribution represents all the possible outcomes and their probabilities. There are many types of distributions. Random variable: A random variable can come from nearly anywhere. For example, the number of heads you’d get if you tossed a coin once would be a random variable; the number of times you get tails before the coin lands on heads; the number of cars that pass through and intersection in the next hour are all random variables; the amount you’ll win or lose in the next 100 hands. Let’s take a look at a random variable named X. We’ll say X has 3 possible values (-1, 2, 17). The variable will be -1 with probability 0.75; 2 with probability 0.2; and 17 with probability 0.05. Notice that 0.75 + 0.2 + 0.05 = 1. Notice the pattern. *Use that to calculate E(X3) on your own. It’s important to note the variance has units of the measure squared. For example, if you were keeping track the amount of money you made or lost each session in terms of $, then variance would be measured in $2. If we had series of results we could use them to estimate variance. Since there are 5 results we can assign a probability of 1/5 (0.2) to each result. And estimate the variance using the same method as above1. **Use the results to estimate the variance/100. Fortunately, if you have PokerTracker you can find variance without calculations. Go to the sessions tab and click more detail. It will list your standard deviation; variance is standard deviation squared. Expectation is proportional to the number of hands you play. 2) The stakes you play squared. 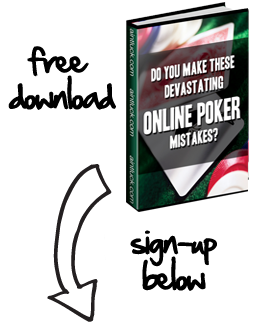 Doubling the stakes you play will quadruple the hourly variance you experience. Standard deviation (SD) is the square root of variance. As mentioned earlier, variance is proportional to sample size. Standard deviation is the square root of variance. Since SD is the square root of variance, SD is proportional to the square root of sample size. If the variance per 100 hands is X, then the SD per 100 hands is sqrt(X); the variance per 400 would be 4X and the SD per 400 would be sqrt(4X) = 2*sqrt(X) = 2*SD per 100. When our sample size quadruples our SD only doubles. This is very important for our long term results. Many players want to know what percentage of poker is luck and what percentage is skill. The coefficient of variation (CoV) measures that. CoV is equal to standard deviation divided by TWR. Note: BB is a big bet in Limit Hold’em. It is equal to twice the big blind. In a 4/8 game the small blind is 2; the big blind is 4; and a big bet (BB) is 8. In a Limit Hold’em game a very good player can make 2BB/100 (including bonuses and promotions) and will have a SD of 18BB/100. You might think of true win rate as the skill factor, and standard deviation as the luck factor. As we can see here, the luck factor for 100 hands is far greater than the skill factor. After 10,000 hands the skill factor has become greater than the luck factor. After 1,000,000 hands the skill factor is far greater than the luck factor. The luck to skill ratio is referred to as the coefficient of variation (CoV). The technical definition is SD/WR. Using the above example, the CoV is 18/2 = 9 for 100 hands; 180/200 = 0.9 for 10,000 hands; ***What is the CoV for 1,000,000 hands? As n increases, the CoV (the luck to skill ratio) decreases. As n approaches infinity the CoV will approach 0. The more hands you play the less luck matters. In the short term luck will dictate results; in the long term skill will dictate results. 1 For reasons beyond the scope of this article this estimator actually biased. The answer given should be multiplied by n/(n-1) or 5/4 in this case.